Udenfor Tbilisi tilbyder Georgiens sightseeing en cocktail af historie, kultur og naturlige vidundere. 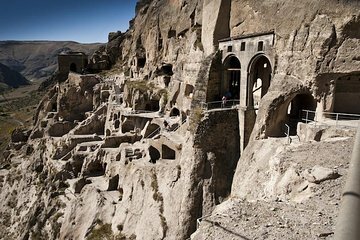 Se tre top-regionale attraktioner i en dag på denne guidede sightseeingtur til Borjomi-mineralske kilder, Vardzia-hulbyen og Akhaltsikhe (New Fortress), alt efter eget køretøj og med kommentarer fra din guide for at udfylde dig på de seværdigheder, du passerer . Russian and English speaking tourists were combined in one tour ! the tour guide had to keep translating. The bus was so uncomfy, the driver was driving so fast and like crazy, the tour guide had a looooww voice that I had to ask him many times to raise his voice because I couldn't hear him. The tour operator is not that good, but the views and places you're going is worth it. EXTREMELY uncomfortable bus. Very very tide space. We were not informed that we will get back to Tbilisi at midnight and we had other plans that we needed to cancel as well as we will very hungry when we got back. The tour was good, it was a 14 hour round trip. We especially enjoyed seeing the Vardzia caves which was a highlight of the tour. It was interesting to see Borjomi but we felt we were there too long just to taste water.